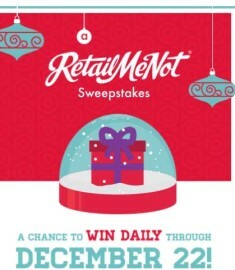 Enter the Retail Me Not sweepstakes today to be entered to win one of five prizes worth up to $10,000! I love a great holiday sweepstakes, tis the season to win free stuff! The Show Me The Money sweepstakes is a great holiday giveaway worth your attention. You can also win on the super fun Instant Win game! 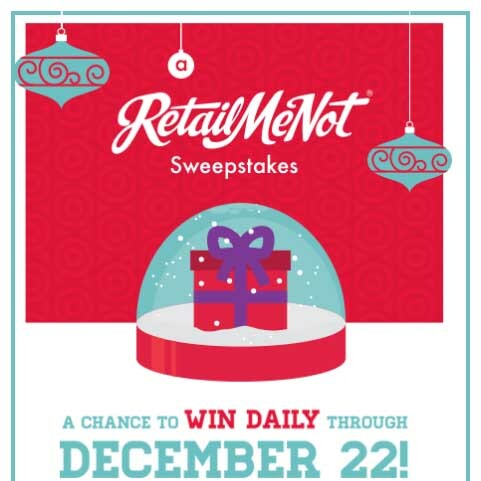 Enter the Retail Me Not sweepstakes today or at least before the closing date of December 22nd, 2013. To enter simply sign up and come back daily (Yay another daily sweepstakes) for your chance to win instantly! (Instant win games too 🙂 You could instantly win an eGift Card and be entered to win a weekly prize! You can alsocan share with friends or Tweet to earn additional entries and snow globe shakes (the instant win games you will see). To enter you can download the RetailMeNot App and follow the links and instructions available from the RetailMeNot App or you can enter through the RetailMeNot website. You can play once a day. Here are some of the amazing prizes available: Five (5) $2,000 Best Buy gift cards to buy a TV entertainment system (ARV $10,000), Ten (10) $1,000 Visa gift cards for a shopping spree (ARV $10,000), 1 Ten (10) $1,000 Blue Nile gift cards (ARV $10,000), Twenty (20) $500 west elm gift cards (ARV $10,000), A $10,000 Expedia Voucher. Finally each confirmed winner of the Instant Win Game will receive a reward code that will allow the winner to claim a $25 Quantum Rewards. TOTAL ARV OF ALL PRIZES: $550,000. I love seasonal sweepstakes! Shake it (snow globes not booty’s) with Retail me not, the home big savings! I love Christmas sweepstakes 2013! It Would Be Be Excellent to WIN…..it’s Been a long time……Wishes….. It would be nice to win that, just to have some kind of Christmas. Has anyone actually won anything yet or is there a best time to shake? I won a $25 gift card! I’m not a lucky person to win things but heck I’ll give this a try.